Tallahassee Paintball Sports, technically located in Havana, is a pretty great place for some weekend paintball. They offer both paintball and airsoft. They have several netted airball fields for close-quarters, quick, competitive play. Intense matches are sure to get your blood and adrenaline going! They have open paintball on weekends, and offer reservations with some group discounts as well. Their prices are all pretty reasonable. Tallahassee Paintball Sports is a field paint only facility, so plan on buying your paint on site before you can play! They offer both traditional and Low Impact paintball for new and younger players. Low Impact’s lower velocity and smaller caliber make it more accessible for children or new players who might be uncertain about how much it will hurt. It’s great because it’s still fun for all ages! All players are required to sign a waiver prior to play. Players under 18 will also need the signature of a parent or guardian. The waiver is available on their website for download. GTF Paintball in Yulee is a versatile place to play some paintball. They have six fields, including a large woodsball with a bus, a bunny field, an urban field, a Splatterball field and a fort. In general a versatile place with lots of field types to enjoy. They have netted areas for spectators as well. Their field and rental fees are fair. GTF Paintball is a field paint only park, so plan on purchasing your paint when you get there. Their paint prices are more than reasonable, though, so you don’t need to worry about it. They have open play every weekend, and weekdays are open by appointment only. They have several party options to choose from. Overall, GTF Paintball is a great paintball park to add to you list! All players must sign a waiver prior to play. Players under 18 must also get the signature of a parent or guardian. The waiver is available to download on their website. 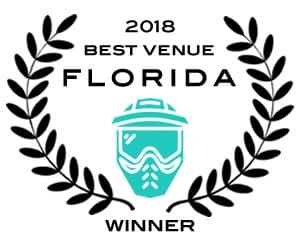 Hudson is home to the largest paintball park in Florida: Gator Paintball Xtreme. They offer both paintball and airsoft. They have a wide variety of fields to play on including multiple hyperball fields, hybrid woodsball fields, a two-story castle field, and other various man-made and natural hazards for a variety of ways to play. Their field and rental fees are very fair. Gator Paintball Xtreme is a field paint only park, but their paint prices are more than fair, so it won’t break the bank. Just plan on buying your paint when you get there. They also offer memberships and special discounts for active military and first responders. Plus, play for free on your birthday, making it a great place to host your party! Overall, they have a lot to offer at Gator Paintball Xtreme, and you should definitely plan a visit out there. Waivers are required for all players. Players under 18 will also need the signature of a parent or guardian. Waivers are available to fill out electronically on their website. Located in Haven is a great, kid-friendly paintball park: Action Paintball. In addition to traditional paintball, they also offer SplatMaster Low Impact paintball and laser tag. SplatMaster uses a lower velocity and smaller caliber, making it more accessible for new players and younger player, while still being fun for all ages. They also have a fun shooting range. They have three fields, including one airball field. The other two are scenario fields with some great hazards and fun game modes to keep your games fresh. Their field and rental fees are all reasonable. Action Paintball is a field paint only facility, so plan on buying your paint when you arrive. Action Paintball also offers memberships, which will get you discounted rates. If you’re a frequent paintballer, definitely take a look at that. They also occasionally host special events, so make sure you check their events calendar! All in all, Action Paintball is a great place, especially if you have younger children. This is the perfect place for a birthday party for a younger child or teen. All players must sign a waiver before they can play. The minimum age is 8 (for SplatMaster) or 10 (for traditional paintball). Players under 18 must also get the signature of their parent or guardian. The waiver can be submitted electronically on their website. Hot Shots Paintball in Loxahatchee Groves is a fun place to enjoy a day of paintball. They are a field paint only facility, so plan on getting your paint there. Their prices are decent, but their paint is on the pricey side. Make sure you plan ahead before going. They have seven fields for playing, and more on the way. They have a good variety of hazards, including spools and a bus and other vehicles. They have two training fields for players who are new to the sport, for a closer, smoother game. They offer a really cool summer camp for players ages 10-18, definitely check that out. Their fields are great, and they’re adding more, so there’s more to look forward to. This is a great paintball park to keep an eye on. They already have a great selection of fields to play, and they’re working on expanding that to give the best possible value to their players. A great place to visit run by true fans of paintball. All players must have a signed waiver prior to play. Players under the age of 18 must also get a waiver signed by their parent or guardian. The waiver can be submitted electronically on their website.